SocioSpy is a social app made for people who want to find friends who use different online social networks. It was created by Victor Slivinsky for an iPhone, iPod Touch, and iPad and it costs $1.99. SocioSpy is a search engine that can find profiles on 21 different social networking sites. The sites include more popular networks like Facebook, Twitter, Gmail, LinkedIn, Myspace, and more obscure ones like, FriendFeed, Hyves, Schoolbank, Reddit. The equivalent of the function that this app serves is typing a person’s name into Google to see what social networks the person uses. 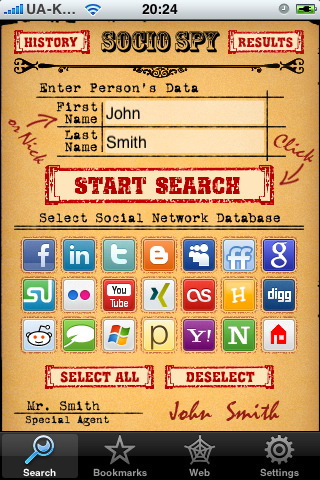 To begin using SocioSpy, you type in your friend’s first and last name and hit search. You can narrow your search by selecting or deselecting any of the 21 networks. The app will inform you how many profiles were found through that search, then gives you a list of names. The list includes a picture—if there is one—and an icon showing which network the person is on. When you have selected a person from the list, a brief outline is given of the personal information the person has listed on the site, as able to be viewed by the public. 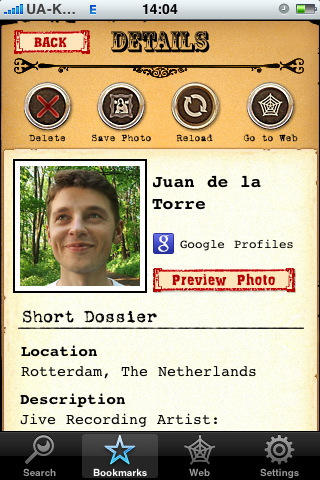 Another option, once you have chosen the profile, is to save the person’s photo. You can also link directly to the web browser in the app, so you can add the person to your contacts list if you happen to be a user of that particular social network.. When you find someone you want to get in touch with you can bookmark the profile. There is a web-accessing feature integrated into the app so that you do not have to toggle between Safari and SocioSpy when you are on your search. In Settings, you have the ability to customize the searches and the results pages. This app is perfect for your inner stalker because you do not have to go to each individual website to find the person of your interest. SocioSpy provides it all for you with the touch of a button. Another perk is that it is completely private; no one will be able to tell that you have been on the prowl. AppSafari review of SocioSpy was written by Vanessa Paszterko on December 28th, 2010 and categorized under App Store, Contacts, Search, Social. Page viewed 4447 times, 1 so far today. Need help on using these apps? Please read the Help Page.